Do you want to build a website without having to worry about any code? Hiring a developer would do the trick, but could cost you a lot of money. Thankfully, WordPress page builders now make it possible to create a professional WordPress site cheaply and easily all on your own, no coding skills required. In this article, we’ll compare the best drag and drop WordPress page builders for creating a WordPress site. Why Use a Drag and Drop WordPress Page Builder Plugin? In WordPress, your website design primarily depends on your theme. Most of the premium themes offer tons of features for customization, but they’re too complex for normal users with no coding skills to take full advantage of. That’s where drag and drop WordPress page builder plugins come in handy. A simple WordPress page builder plugin can give you the ability to build beautiful custom layouts and landing pages on your site. With a page builder plugin, you can add any type of content to a page using ready-made drag and drop content elements aka blocks, modules, or widgets. You can easily customize, move, and arrange the content elements to design unique website layouts. The best part is, you’ll need zero coding skills to design with a page builder. So are page builders only for beginners? No, not really. Page builders also help developers speed up when creating custom designs and allows them to work for more customers. Having said that, let’s go ahead and check out the best drag and drop page builders for WordPress. Beaver Builder is the most user-friendly WordPress page builder plugin available on the market. It comes with a true frontend visual editor which lets you design a page with real-time previews. With Beaver Builder, you can easily drag and drop the content modules, edit, and create a landing page within minutes. There’re plenty of powerful ready-to-use content modules. You can customize each module with an easy-to-use toolbar at the top. If you want to start with a template, there’re over 30 professionally-designed templates available. Using a template allows you to create a webpage even faster by simply replacing the sample content with your own content and images. Beaver Builder is a fully responsive and Gutenberg-ready plugin. It’s available both as a free and premium plugin. For simple landing pages, you can install its free version directly from WordPress.org. Why Use Beaver Builder? Beaver Builder is a simple, beginner-friendly page builder which empowers anyone to create a stunning website. It’s a great choice for beginners looking for an affordable website solution. Visual Composer Website Builder is a powerful drag and drop website builder for WordPress. It allows you to create a stunning WordPress website quickly and easily. Just like Beaver Builder, the Visual Composer plugin features a real-time live editor which lets you see each change you make on the page instantly. You can directly click on any area on your page to edit and customize content. The plugin comes with a bundle of professional templates out of the box. There’re powerful design options to customize the look of any element. You have full control over spaces, borders, background, parallax effects, and more. Although most features are similar to Beaver Builder, Visual Composer can do a lot more. You can also edit your website header, footer, menus, logo, sidebars, etc. Visual Composer is a great tool for both beginners and developers. A beginner can quickly create a website with ease, while developers can improve their workflow and create custom content elements and more powerful themes for their customers. Why Use Visual Composer? 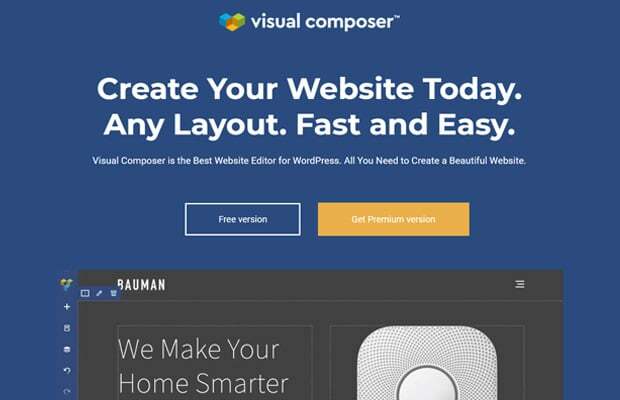 Visual Composer is a complete website builder for WordPress. If you’re looking for an easy way to customize the entire look of your site including headers and footers, it’s a great plugin to use. The Divi Builder is yet another powerful WordPress drag and drop page builder for WordPress. Similar to Beaver Builder and Visual Composer, Divi Builder is a true WYSIWYG editor (what you see is what you get) which lets you preview your design as you build. Using The Divi Builder plugin, you can customize everything including your fonts, colors, sizing, spacing, etc. and create unique page layouts. There’re 46 simple-but-flexible content elements you can use for building a beautiful page. You can organize the elements the way you want, hassle-free. The Divi Builder plugin includes over 20 pre-made layout templates to quick-start your design. Plus, it allows you to create and save your own Divi layouts and import or export your layouts to use on other Divi sites. Divi Builder plugin is the foundation of the popular Divi WordPress theme. However, you can use this plugin with any other theme. The advantage of buying this plugin is that you’ll get access to the entire bundle of premium products by its company, Elegant Themes. Why Use The Divi Builder? The Divi Builder is a widely-used page builder plugin, and it has received mostly positive user reviews. It’s a great Beaver Builder alternative and a fantastic option if you want to use other products from the company. Themify Builder is a simple drag and drop WordPress page builder plugin you can use. Like The Divi Builder, Themify Builder is also a power plugin behind the WordPress themes created by Themify company. You can also use this plugin with any other theme. Themify Builder includes a large collection of drag and drop modules and more than 40 professional templates specifically designed for different industries. The plugin allows you to edit your pages from the backend or the frontend. In both types of interface, you can freely move the modules around and customize them fully. You can arrange the modules in rows and columns, and create grids with ease. Themify Builder also has 60+ animation effects out of the box to make your pages visually engaging. The core Themify Builder plugin is free of cost; however, you can buy their Addon Bundle for advanced modules. Why Use Themify Builder? Themify Builder is a free WordPress page builder plugin you can use to build simple webpages. The Addon Bundle also is available for a fair price. Elementor is one of the most popular WordPress page builders available on the internet. It’s a visual drag and drop editor which enables you to build a website in no time flat. With Elementor, you can find over 80 design elements, including widgets, to generate more traffic and leads. You can edit and customize every part of your site by simply clicking on it directly. Similar to other plugins on this list, it also comes with ready-to-use templates. You can import a template, quickly customize its content, and publish a page. It saves you a lot of time. Elementor is a fully responsive plugin so your website will look great on any type of device. It’s also updated with the latest WordPress version with the Block editor. Why Use Elementor? Elementor is easy-to-use and beginner-friendly. Anyone can quickly learn its interface and start creating beautiful pages with this plugin. Its lite version is a good option for small businesses who’re just starting out. After our review of top 5 WordPress drag and drop page builders, we can confidently say that Beaver Builder is the best choice. Its simple interface coupled with powerful features make it the best page builder for WordPress. However, if you’re looking for a complete website builder with options to edit site headers, footers, and menus, you can use the Visual Composer website builder. Now that you know which WordPress page builder to use to create beautiful landing pages, you may want to know how to grow your website’s traffic and conversion rate. If so, then you should try MonsterInsights. 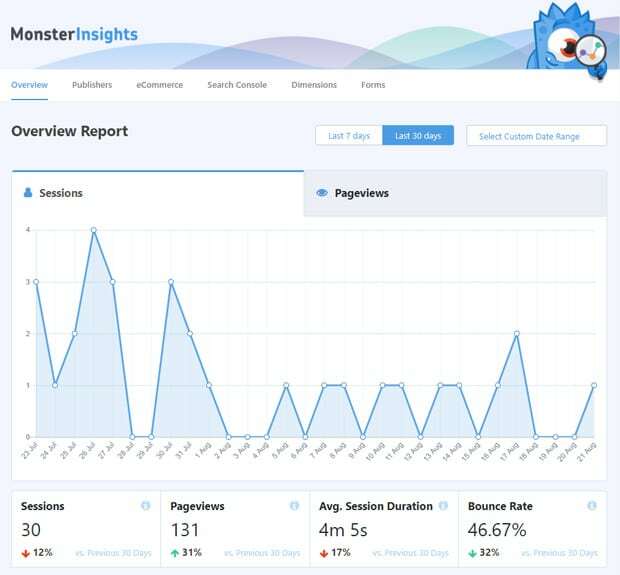 MonsterInsights is the best Google Analytics plugin for WordPress. It helps you to install Google Analytics in WordPress easily and provides you with your most important website metrics right on your WordPress dashboard. Then, using your website stats, you can make informed business decisions to grow your traffic and leads. We hope this article helped you to find the best drag and drop WordPress page builder plugins. You may also want to see our list of must have WordPress tools and plugins for business sites. And don’t forget to follow us on Twitter and Facebook for more helpful Google Analytics tips.